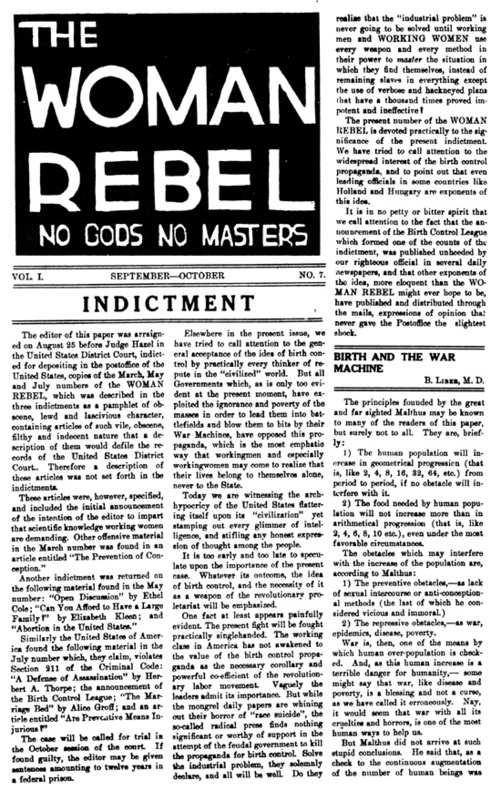 It was in March 1914 that Margaret Sanger published the first issue of her radical, anarchist monthly, The Woman Rebel. Edited and published by Sanger, who sought to educate and raise the consciousness of working women through a newspaper devoted to their specific needs. Emblazoned with the slogan, “No Gods, “No Masters,” it was designed as a call to arms for working-class women. From its first appearance that March, The Woman Rebel generated controversy, as each issue included discussions of such radical issues as the use of violence as a tool of striking workers to women’s right to sexual freedom. Sanger used the journal to assert that every woman had a right to be “absolute mistress of her own body,” including the right to practice birth control, a term coined for The Woman Rebel. As her actions garnered attention and support for her fledgling movement, Sanger finally returned to New York to stand trial in 1915. But within a few months, her five-year old daughter, Peggy, died of pneumonia. As expressions of sympathy poured in, notable friends and supporters sent letters and petitions to President Woodrow Wilson affirming their support for Sanger, while others raised defense funds. With the intensified coverage of The Woman Rebel case and the birth control movement, the government decided to avoid further publicity and decided not press charges. Only eight issues of The Woman Rebel ever published, it was was one if the first publications to focus specifically on the problems of working women and to articulate a new feminist agenda for the 20th century. And the attention and controversy it generated helped launch a national birth control movement with Margaret Sanger as its leader. One hundred years later, it seems the battle has not yet been won!